Facing Palau Vecchio’s beach, and close to the harbour and town centre, this beautiful penthouse apartment enjoys a stunning view on Maddalena Archipelago’s. 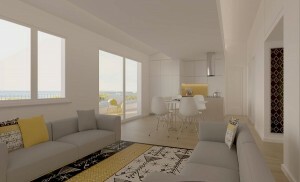 The apartment has a wide living room with open kitchen, double bedroom with en suite bathroom, single bedroom, bathroom, a big terrace facing the sea and a garage. 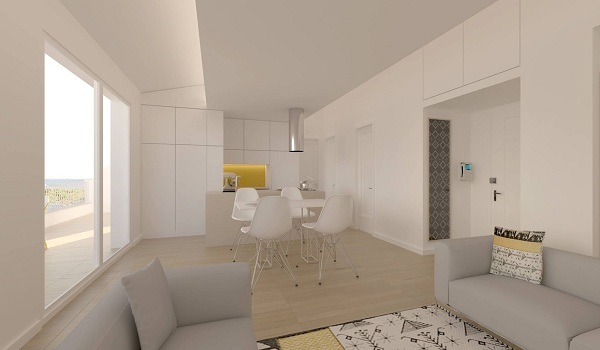 This apartment, is not only perfectly located, but features a unique design proposal, that joins the island traditional iconography with modern ideas and design. Interior design focused on the wide open space that hosts both the kitchen and living room, and on its connection with the outdoor terrace, so close to the sea. In fact, a wide rectangular soffit area defines the longitudinal axes along which the functions are placed, and hides electrical fittings, air conditioning and so on. Such choice, creates a simple, minimal but cosy environment, enlightened by soft and uniform environmental light, strengthened carefully placed functional recessed spotlight. Furniture and finishes have been carefully chosen to be modern, light and cosy, thanks to the use of natural wood and white. Oakwood light hardwood flooring, matches the shades of natural light wood chosen for the kitchen top and table legs, as well as the matte white lacquered surface of the table top and custom made furniture for the kitchen. Colour palette chosen for decorations and fabrics play on the combination of warm intense yellow and dark neutral grey. This shade underlines the bright relaxing yellow tone, and at the same time tones done the warm wooden floor.